There are almost as many fitting techniques as there are bike fitters. It used to be that you were dependent on getting someone knowledgable and with a 'good eye' to get a good fit - and there are certainly some long time fitters who have any uncanny ability to identify and correct problems by eye alone. However, we are now in an age where you don't have to hope that the person you are relying upon has that knowing eye. There are a number of programs now available to shops that make sure you get the best fit possible. Two that we have tested are Retül and Specialized BG Fit, which are very similar, especially since Specialized bought Retül last year [Note: technically, Specialized made a "strategic investment" in Retül]. Further to this, Retül founder Todd Carver started out with Dr Andy Pruitt, the godfather of the Specialized BG Fit program. The biggest difference might be that you can only get BG Fit at a Specialized dealer, while the Retül system is available to any retailer or fit agent who goes through the certification program and purchases the appropriate equipment. The Specialized BG Fit system is really an extension of the company's ongoing development of their Body Geometry shoes, helmets and clothing. Developed by Dr Andy Pruitt of the Boulder Centre for Sports Medicine, there are two levels to the BG Fit program. The standard BG Fit is based on collecting information from the rider about their riding experience, style, any past and/or present injuries or issues, followed by an assessment of flexibility and some measurements. 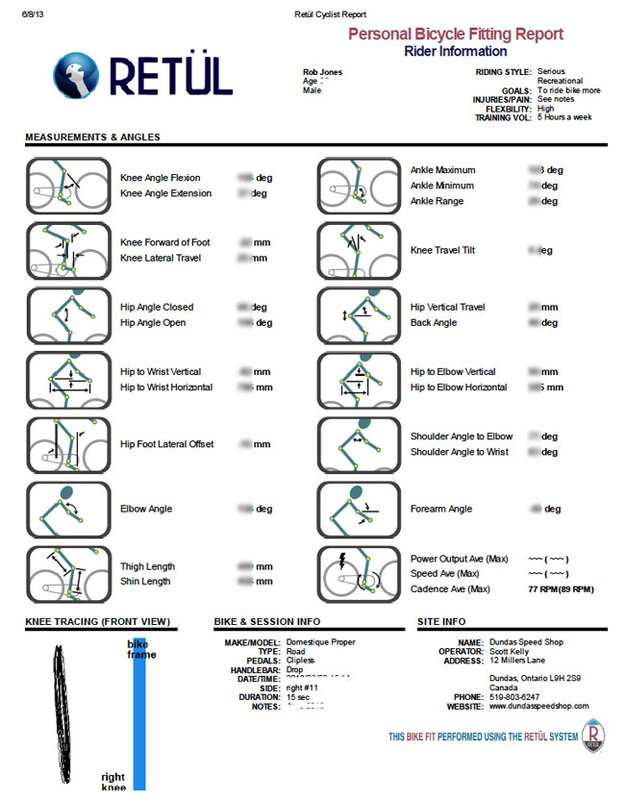 Based on this, the Fit Tech will determine the appropriate sizes for such things as saddle and handlebars (which width), and a starting point for saddle height, reach, etc. At this point, they will put you on your bike (or a standard unit) and have you ride while they observe and make adjustments as needed. With an experienced technician this can give you a really good fit. However, the BG Fit Data takes it to the next level, adding video cameras that are linked to a computer program to capture pedaling motion so that it can be analyzed precisely before and after any changes are made. Things such as a knee flicking out (which is wasted power) can be identified, adjustments made, and checked to confirm it has been dealt with. Specialized has made a significant investment in training their dealers, who have to go to Specialized University (SBCU) to become certified. There are different levels, with Master being the highest. I went through the certification program with a group of dealers and other media some years ago and it is impressive. The cost is anywhere from $100 for a basic sizing fit to $250-plus for a full Pro fitting that can take two or more hours. For a list of BG Fit retailers go Here and filter by BG Fit. As with BG Fit, an initial assessment is done by the technician, who then does a basic bike set up, including swapping around stems and bars as needed. 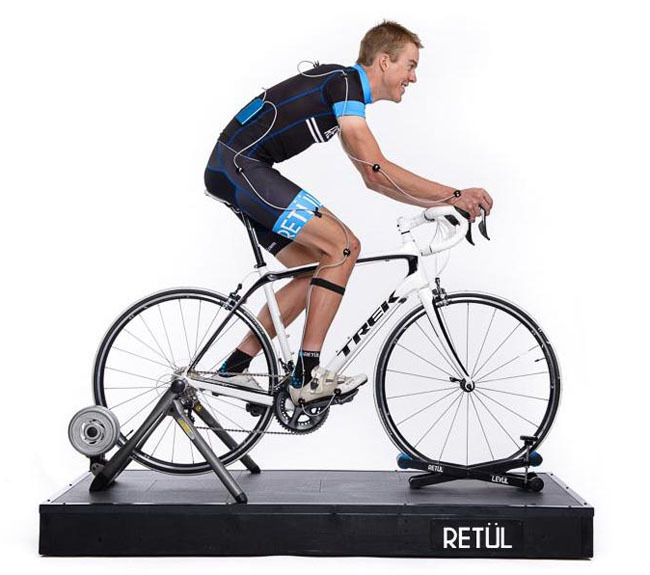 After this, you get on the bike and are 'wired up' with LEDs attached to major joints - seven on each side of the body, which feed information to sensors, which in turn builds up a profile of riding motion using the Retül software. Based on the results of the initial spin, adjustments are made and then you ride again to see what the impact is. At the end you are provided with a printout of all the results. I went through the Retül program with Scott Kelly of Dundas Speed Shop, who also works with the national mountain bike team and the Scott-3Rox team. I'm somewhat of an unusual subject, since I've been fitted so many times that I have a pretty good idea of what works for me. I wasn't expecting any radical changes, but to make sure it was a 'clean' fit, we did it on the Cafe Domestique Proper that I was going to review. Like all fitting programs, Retül isn't precise to the millimetre - just because two people have the same physical dimensions doesn't mean that they are going to be comfortable with the same set up. Your set up will change over the years as well, depending upon your fitness level and any injuries you may have had. For example, the Retül analysis picked up on reduced flexibility in my right ankle compared to the left due to a previous injury, and a slight imbalance in the left and right sides of my upper body. Overall, the analysis suggested that I use a slightly longer stem then I currently use and raise my saddle about a centimetre for better extension. These findings are in line with what I would expect, since saddle height usually falls within a range that is dependent on individual comfort. I did move to a longer stem, and it does seem to be a better fit. The Retül fitting takes about two hours and, at Dundas Speed Shop, costs $250, which is fairly average. Scott did point out that a portion of their fitting fee goes towards covering the cost of free fittings to younger athlete with the provincial or national team.